We know that Bangaloreans are beach crazy, and lucky for them, they need only drive a short distance from the city to hit up golden sands and splendid, frothy waves. We’ve scouted the best ones for you, complete with surfing, paragliding, and dolphin spotting. 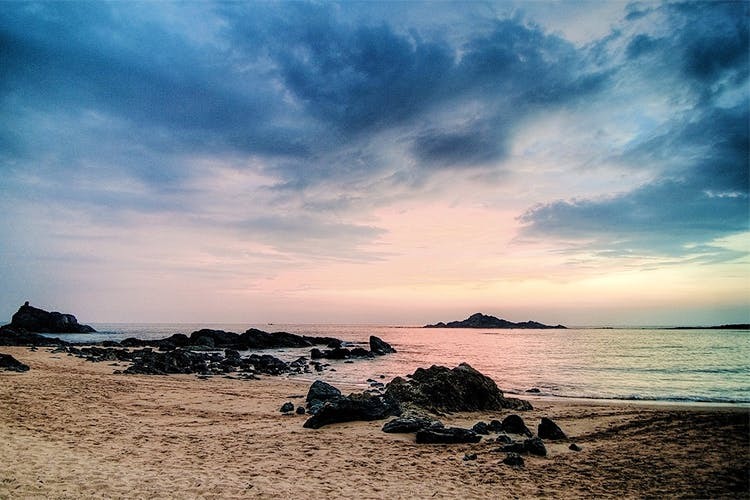 If you’d like to beach bum at a place that’s a lot like Goa but is more easygoing, then hit up Gokarna. At the town’s popular Kudle or Om Beaches, you can spend many an hour sipping a cold beer at seaside shacks. For a more secluded experience, you can escape to the nearby Halfmoon and Paradise Beaches. Accommodation is limited to basic hotels or cabins by the beach. Presided over by the world’s second largest statue of Shiva, the calm waters of Murdeshwar make for an ideal getaway from city life. Nearby, Netrani Island, just off the shore, is a popular diving site where you’ll be able to spot coral, eels, parrot fish and other underwater beauties. Mid-range and basic hotels can be found easily here. A busy city with a generous coastline, beach-hopping in Mangalore is rewarding experience. You can start off at Panambur Beach as you watch ships sail from the port. The beaches at Ullal and Someshwar are serene spots surrounded by palm groves and offer spectacular sunset views. For stay, you can pick between budget stays at the heart of the city or cosy beach resorts. Udupi’s unspoiled beaches are perfect for a sun-kissed holiday. At Malpe, you can sign up for a crash course in surfing. However, if you are looking to embrace surfing as a serious pastime, do stop by the relatively unknown fishing hamlet of Kodi Bengre near Manipal. The Shaka Surf Club calls this picturesque estuary home, and you can learn how to ride the waves like a pro here. Kaup Beach, closer to Manipal, and the breathtaking Marvanthe, where you’ll be surrounded by the vast Arabian Sea on one side and the River Souparnika on the other, are worth a visit. You’ll find a mix of beach cottages and mid-range hotels here. A tourist favourite, Pondicherry’s French Quarter is where you can explore old-world homes with cascading bougainvillea and historic sites before hitting the Promenade Beach. Ideal for long walks, the main beach is packed with war memorials, and statues of Mahatma Gandhi, and the former French governor general, Dupleix. For quieter sojourns, you can escape to Paradise and Auro Beaches on the outskirts. When booking your stay, you can pick between star properties, chic boutique hotels, and run-of-the-mill lodges. Just outside Chennai, you can spend a weekend gorging on seafood and sipping on cold drinks at a shack on the packed Mahabalipuram beach. Once you move away from the main tourist spots, you’ll be able to splash around in turquoise water, surrounded by white sands, as dolphins merrily pass by. Plush resorts, mid-range beachside digs, and basic homestays are all available here. A short drive from Kerala’s capital, Thiruvananthapuram, Kovalam is full of beach lovers from across the globe. The Lighthouse Beach, with its black sand, is lined by restaurants and shops from where you can watch the waves lap the shore. On the opposite side, Hawa Beach is crowded with sunbathers, while the steep Samudra Beach offers a more peaceful experience. Lavish hotels and beachside properties are common here along with homestays and hostels. Nestled behind gorgeous, red cliffs, Varkala’s popular Papanasam beach is thronged by tourists looking to work up a tan or by spiritual seekers looking to wash away the sins of their past life. In between rounds of beach volleyball, you can head to makeshift shacks that offer relaxing Ayurvedic massages. Stay options include hotels that suit a backpacker’s pocket or sprawling resorts with the best amenities. Enclosed by the Sal River and the Arabian Sea, Cavelossim paints a pretty picture with its stark black rocks and white, smooth sands. By the beach is where you sit back and watch dolphins or you can traverse the waters in speed boats. To complete your dreamy holiday, you can park yourself at luxurious hotels and resorts that the area is famous for. North Goa’s Arambol Beach is off the tourist radar and can be reached by walking through a dense growth of trees. Nearby, a fresh water lake comes with hot water springs and valley views that, together, make for a gorgeous sight. For a rush of adrenaline, you can paraglide above the calm, blue waters. Easy-on-the-pocket hotels are all the rage here. This post first appeared in Little Black Book, Bangalore.